In the stock music song category, you have a great overview of our vast amount of different stock music styles. Featured in this selection is a variety of songs from the genres we cover: from jazz to lounge, rock to electro, children’s music to romantic tunes, epic orchestras to spherical synthesizers and from solemn choirs to rhythmic hip hop - you name it, we offer it. Not only the genres are diverse, but also the various moods, rhythms and speeds. In any of our subcategories, you can find an array of differently nuanced vibes. Looking for uplifting acoustic tracks? Or production music that is supporting your press and news event? Yes and yes. Of course, genre limits are arbitrary, and many of our songs take influences from various styles. For example, one stock track can be used for both an action video game and a commercial. Depending on your project’s specific context, you can see that any royalty-free song from our library can be used in multiple ways. From a creative standpoint, Sonic Liberty offers any stock music song you need, in one place. In addition, from the legal (and more boring) side, we have got you covered, as well. 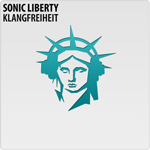 All of Sonic Liberty’s tracks are cleared for royalties. This means that any song you download from us is directly licensed. Upon purchase, you acquire all necessary rights, including the sync and master rights. A royalty-free song is immediately usable as all legal procedures have been completed by us beforehand. Of course, we are not trying to sell you a pig in a poke. For your convenience, before you make a purchase, you can download any song and embed it in your project. For example, you can download the aforementioned uplifting acoustic track and test it within your commercial. If you like what you hear, you can purchase the corresponding license prior to publishing your work. In the unlikely event that you cannot find the right track you need, we are happy to provide a composition tailored to your specific needs. If you have any questions regarding specific licenses and pricing, pleaser refer to our FAQ or contact our customer service. We hope you enjoy browsing through our extensive library.